Weighty Matters: Gastric Bypasses Destroy Lap-bands in Head to Head Study! 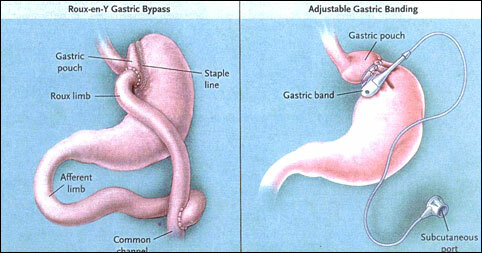 Gastric Bypasses Destroy Lap-bands in Head to Head Study! While this wasn't a randomized or blinded trial, the results were striking. 442 case-matched patients were followed for 6 post-operative years. Half received a gastric bypass, and half a gastric band. While early minor complications were higher in the gastric bypass group (triple the rate seen in banding), major complications were similar. Aside from that, it's all bypass with the bypassed patients enjoying quicker losses, larger maximal losses and significantly better maintenance of losses. After 6 years, for every failed gastric bypass, there were 4 failed lap bands (with failure determined by BMI greater than 35 or reversal of the procedure). For every 1 long-term bypass complication there were 2 lap band complications, and for every 1 re-operation of a bypassed patient, there were 2 of lap banded ones. Given how damning these results were, the journal invited noted band surgeon Jacques Himpens from Brussels to try to provide some balance in an after article commentary. The study could have used surgeons known to be leading experts in banding and bypass. The mechanistic failing of banding to impact on weight related gut peptides might turn out to be an advantage in the very long term. The band is more readily reversible. Of course Dr. Himpens also clearly stated that he himself agrees gastric bypass is a "better" procedure than gastric banding. Seems like the decision of which surgery to have just became a great deal clearer for those who are considering one.